I'm a hat gal, and for Christmas I received a cobalt blue beanie, which I have yet to take off my head despite being a bit smurf like. A bright beanie is anything but basic and an inexpensive way to jazz up winter wardrobes. Since one of my new year's resolutions is to add more color into my closet, I plan on getting a neon orange beanie next for some additional pop. 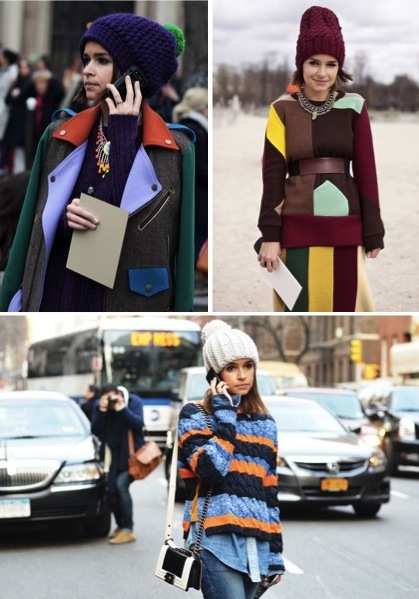 If a neon hat isn't up your alley, you can always go for an extra thick, uber cool, knit beanie a la Miroslava Duma. This kind of cap fights some serious cold while working to convey your inner alternative kid. would you like to see my video? Tell me if you like it ;) thanks! Cute selection, love the last one! I have been obsessed with my beanie since I got it, it really is the perfect addition to any outfit- definitely gives it a "cool" factor. ;) Let's see you in the blue beanie! I love all of the outfits with the bright colored beanies!! I think I need one now! Great photos! I'm now loving the idea of adding a bright colored beanie to my winter wardrobe! I love these cute beanies! I just wore one in a recent post - not only cause it's cute but it was really cold haha. I keep seeing them everywhere I really need to go buy one for myself!! I'm in love with beanies. In Seattle, they are useful too. I like these. Amazing beanies! Love your blog! LOVING the beanies too...ll of these photos are exactly the reason why..great inspiration! I literally bought a neon yellow beanie last night! 6 bucks at H&M...they have tons of options.